Top: Chinese lawyer and art collector Liu Gang. Like all famous historical figures, Zheng He, the greatest navigator in Chinese history, has not escaped controversy. The size of his fleet ships and the routes his voyages took continue to ignite heated debates worldwide. At last week's first international forum on Zheng He's voyages held in Qingdao in East China's Shandong Province to mark the country's third Navigation Day, which coincided with Zheng's historic maiden overseas voyage 600 years ago, scholars and some diplomatic officials to China from the countries which Zheng He's fleet visited, sat together to explore the historic resources of his voyages. 1421, The Year China Discovered The World, a controversial book published in 2003 outlining the voyages of Zheng He during the time of Emperor Zhu Di of the Ming Dynasty (1368-1644), made Gavin Menzies, a retired British Royal Navy captain, known to the world. The book put forward a theory that Zheng He discovered America 70 years before Christopher Columbus (1451-1506) did in 1492. Now the old man is preparing his next book about Zheng He's visits to Europe. "He sailed all around Europe. It is all there in European records," he says. He presented at the international forum a piece of powerful evidence he has collected, an Italian record of the Pope meeting Zheng He's representatives, which was drafted by a friend of the Pope. Menzies believes Zheng He led three major expeditions to Europe and brought maps, mathematics, architecture, art and steel weapons to Europeans. Menzies' book has been sold in 135 countries and is even taught in American and English schools. Every single day, there are about 3,500 visits to his website (www.1421.tv) and he gets hundreds of thousands of emails from all around the world, 99 percent of which, he claims, says it is obvious that Menzies is right. "Actually, there is nothing new in what I am saying. I am just incredibly lucky with the timing of my book's publication as everyone had begun to show interest in China, a booming and fascinating country. 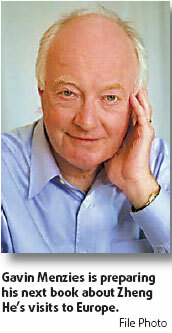 If I'd written it ten years earlier, nobody would have been interested in it," he says. Menzies' conclusions that Zheng He's seven voyages reached all corners of the world did win some support from Chinese scholars. 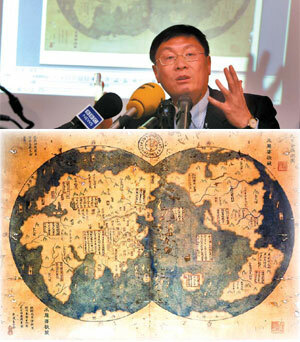 In early 2006, Liu Gang, a Chinese lawyers who spent a lot of time collecting ancient Chinese maps, unveiled to the public a world map in the form of double hemispheres that he bought in 2001. He believes it to be a 1763 copy of a 1418 Ming Dynasty (1368-1644) original, after he read Menzies' book. The map gives credence to Menzies' theory that Chinese sailors traversed the globe long before their European counterparts. However, although carbon dating has shown that the paper is real, many people doubt modern technology could have identified the date of the ink put on the map and believe it a 21st-century fake as many of the names of places recorded on it began to be used only in the Qing Dynasty (1644-1911). But Liu Gang still believes the bi-hemispherical, world map originated in China and even concludes that the first map of the kind was made by a scholar named Zhu Siben in the early 14th century during the Yuan Dynasty (1271-1368). He says ancient Chinese scholars already knew the world was round and later Zheng He sailed the oceans and mapped the world. However, Menzies' opinions are not accepted by mainstream Chinese historians, who believe all of his conclusions are based on subjective deductions. Now a dominating opinion shared by most scholars is that from 1405 to 1433 Zheng He commanded seven voyages mainly around the Indian Ocean region ranging from India, Sri Lanka and Arabia to East Africa. "Menzies' logic in the whole book is wrong. How could he draw the conclusion that the world's geographic knowledge must have come from Zheng He's fleet since Europeans did not have the knowledge at that time? He ignores the fact that Arabians had better navigation techniques than the Chinese for quite a long time before the Ming Dynasty," says Ge Jianxiong, professor of Fudan University and chairman of the Committee for Historical Geographic Studies under the Geography Society of China. Du Huan of the Tang Dynasty (AD 618-907), once captured by the Arabs for 11 years, clearly recorded when he came back to China that he boarded an Arabian commercial boat, which shows that the Arabs had opened a navigation line from the Indian Ocean and Arabian Peninsula to China much earlier, Ge says. According to Ge, Zheng He was a descendent of the Hui nationality (Chinese Muslim), whose ancestors migrated to China during the Yuan Dynasty. At that time, Quanzhou of East China's Fujian Province had become a city of Arabian migrants and culture. His grandfather and father had been to the holy place of Islam, Mecca, on a pilgrimage. So Zheng could have had access to Arabian geographical and navigational knowledge. "As far as we know, no navigating lines and places Zheng He's fleet had been to on the Indian Ocean went beyond Arabian areas," says Ge. He agrees that Zheng He could possibly have reached east Africa, but those areas were actually within the areas covered by Arabian navigation. As for Menzies' theory that Zheng He's 1418 world map enabled Columbus and Magellan to reach the New World, Ge believes that including certain places on the map did not necessarily prove that Zheng himself had been there as knowledge of the map could have been obtained from the Arabs. It is believed that apart from the emperor's support, Zheng He's voyages at that time were largely opposed by officials and the common people as each voyage cost a lot. So after Zheng died, most of his records were destroyed by the ministers for fear that the new emperor would demand a new voyage. "That adds to current difficulties of understanding that period of Chinese history. I have observed that despite more and more people enthusiastic in studying Zheng He, there has actually not been much progress in past decades," says Ge. He believes that scholars with a sound history and culture knowledge as well as navigation techniques are the need of the hour. 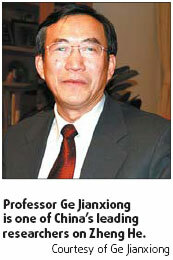 He welcomes more scholars such as Menzies to join the research on Zheng He, searching for more evidence on his voyages. Though the arguments on how many places Zheng He actually reached continue to rage in academic circles, scholars worldwide share exactly the same view of the peaceful and friendly nature of the voyages. According to Ge, Zheng He's seven voyages carried a political mission from the emperor to parade the glory of the Ming Dynasty or to ally with Arabian countries to strike the surviving forces of the Yuan Dynasty, rather than to discover new continents, rob overseas wealth, establish colonies and extend foreign trade as the early Western navigators had done. Chinese people had long regarded their place of residence as the center of the world and believed that those who did not belong to the Han nationality were "barbarians". So the rulers of China in the Ming Dynasty did not have an ambition of expanding the territory, notes Ge. This can be seen on the deeds of Zheng He's fleets, which simply gave rewards to local people and accepted their gifts to the emperor. Menzies believes that Zheng He took rice from China to America, brought back maize from America, took sweet potato from South America to New Zealand and Australia, and took Indian cotton to America and then brought a better strain of cotton to Europe. Besides, all sorts of fruits and animals were also transferred from one country to another. Zaman Mehdi from the Embassy of the Islamic Republic of Pakistan says the most noteworthy aspect of these voyages is the religious tolerance, cross-cultural understanding and respect for local traditions shown by Zheng He. Indonesian scholars credit Zheng He for building many mosques in Java and Malacca. There are also Zheng He temples in these islands, where festivals are held to commemorate his visit. In Sri Lanka while making offerings at a Buddhist Temple in 1410, Zheng erected large prayer inscriptions to Lord Buddha, Allah and the Tamil god Tenayari Nayanar in Chinese, Persian and Tamil languages, which was a remarkable show of religious tolerance. "It is this spirit of harmonious socio-cultural globalization about Zheng He's maritime voyages that has to be understood," says Mehdi.